Cranes have been around for more than 2,500 years, when the ancient Greeks used winches and pulleys to build their temples. But Spyder cranes, also known as mini-crawlers, were developed within the last 30 years by Furukawa UNIC, making them the newcomers to the crane line-up. 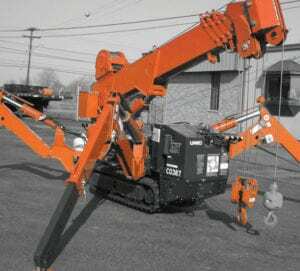 The first Spyder crane introduced in the U.S. was model URW295, and it remains the market leader. Mounted on a dual track chassis, Spyder cranes live up to the nickname ‘mini-crawler’ with a 24-inch width that allows them to fit easily through standard doorways. A lightweight design allows you to move the URW295 on a freight elevator in multi-level projects. With zero emissions options, the Spyder crane can be used indoors or in areas with poor ventilation. And with operating noise at 70 decibels or less, the URW295 runs about as loud as a vacuum cleaner. Lightweight work baskets made of tough, corrosion-resistant chromoly steel can be attached to the boom tip and even provide you with aerial lift capabilities when used with the URW295’s wireless remote control. With a maximum lifting capacity of 6,450 pounds, the URW295 can easily handle the Rolls Royce Phantom, which weighs in at 6,052 pounds. With the boom lift extended, you could pick up a slightly overweight male giraffe. And the URW295 has a 2-speed motor, a 1.4 MPH running speed and a variable piston pump, getting the job done faster than larger machines. Is the Spyder Crane Maneuverable? The outriggers offer 52 different positions, allowing you to set up on balconies, in parking garages, or in hallways. Spyder Crane’s 360-degree rotation and a wireless radio remote control system give you maximum flexibility. The remote system operates within a 300-foot radius and uses a 15-channel frequency to prevent interference. Does the Spyder Crane Offer Engine Options? Engine configurations for the URW295 include battery 110V power, gasoline, propane, diesel, 220V single phase electric, or a combination of gasoline/propane/220V electric. Fully-charged battery powered mini-crawlers will run up to eight hours and can be recharged using 110V wall outlets. All engine configurations meet U.S. EPA requirements. What are the Safety Features of Spyder Cranes? The number of standard safety features makes the UNIC Spyder crane one of the safest machines available today. The crane meets all U.S. crane regulations including ASME B30.5 (required by OSHA) and CSA Z150 compliance standards. For more information about Spyder Cranes and crane service, Portland, Oregon, call the NessCampbell team. Finding the right crane for your job is what we do.